As of February 2016 Flightspeak has ceased to offer training courses as part of its services. However, we will continue to offer services to the aviation training industry. In particular, we still will have for sale our exclusive range of training materials for learners of English in an aviation context. Foundation Aviation English: an intensive course for ab-initio or pre-sessional students. Focussed on basic aviation concepts and essential language for study and work. This course promotes interactive group based oral activities, listening and speaking skills and self expression. It is content based, progressive in language challenges and theme based. It is a good baseline course for those interested in ICAO Level 4 proficiency. The final deadline for compliance with ICAO language proficiency requirements was March 5 2011. Most pilots and controllers below level 6 will need a programme of upkeep to help them maintain level between tests. In addition, ICAO intends to carry out spot checks on proficiency levels via the safety audit program. Do you have a language maintenance programme in place? Some of Flightspeak's past activities. Faces and places. The flightenglish forum listserv provides lively internet discussion on Aviation Technical English topics. It is a way for people in different parts of the world to come together and discuss issues or ask for advice. Membership is by invitation only. Click the panel on the left for more details. Some classroom materials to help you and your students with aviation English. 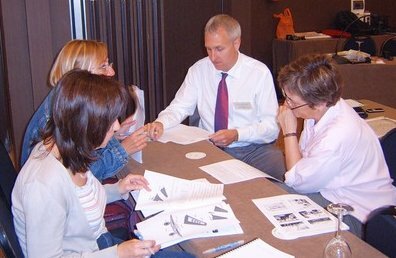 The flightenglish forum is an entirely voluntary grouping of teachers of English language in the aviation sector. The forum is an internet listserv for the exchange of ideas and views covering the whole gamut of Aviation English activities from research to training to testing. The flightenglish forum is not affiliated to any commercial entity or aviation lobby group. The first flightenglish forum workshop took place between 7th and 9th November 2008 was hosted by TopFly Aviation College at Sabadell Airport near Barcelona, Spain. The workshop was aimed at practising teachers of aviation English and explored methods and materials adapted to the task of improving listening and speaking skills. 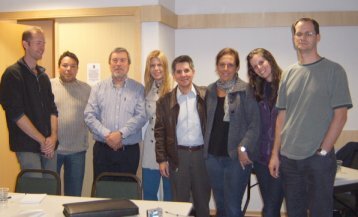 The third Flightenglish Forum workshop took place in Sao Paulo, Brazil in May 2009. The forum was hosted by the BHS School, Sao Paulo whose director Liz Rossi is 4th from left. May 2011. 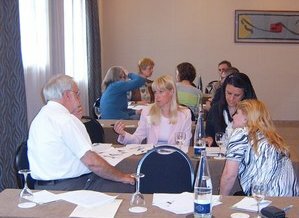 The TALP (Training for Aviation Language Proficiency) Workshop took place in Mataro, Barcelona, Spain. 25 teachers of English for Aviation Purposes from 8 countries attended and took part in approximately 10 workshop activities devoted to expanding and perfecting techniques for EAvP. Mataro proved to be an excellent venue for such a training workshop in terms of climate, accommodation and social interaction opportunities. The 2013 workshop will, once again, saw us congregating in Mataro on 13-14 April.